Bringing up Charlie: Life as a stay-at-home dad - again! Life as a stay-at-home dad - again! It's not often I hear the top-of-the-programme running order for the BBC Radio Four Today programme and leap out of bed with excitement. Ok, that didn't quite happen this morning either. But I admit I was a tad curious when they trailed an item billed as 'what life is really like for stay-at-home dads'. I should've contained myself. For a start, they didn't speak to any (stay-at-home dads, that is). Instead Zoe Williams (who qualified in neither category last time I was looking) spoke of childcare being boring and a chap called Billy McGranaghan from a charity supporting single dads said they have it tough because mums at the school gates are suspicious of them (a lot of them think dads are wishy-washy) and the dads don't have a network of support like the mums do. He then went on to describe the network of support for dads that his organisation - Dad's House - runs. Sounds laudable. And also contradictory. Of the thousands of stay-at-home dads out there (the programme claimed numbers have doubled in the last twenty years and now stand at almost 300,000) I was amazed and rather disappointed that they couldn't be bothered to phone one of us up. There's a lot to be said and speaking to a dad - a stay-at-home-dad - perhaps in preference to a London (female) columnist and member of the capital's chatterati might have been a little more relevant. It might even have been enlightening. I was really keen to hear the item, wondering who they'd asked to contribute, whether it was somebody I knew and what they might have to say. I even set Piezo to record the piece off-air. I shan't be keeping it. 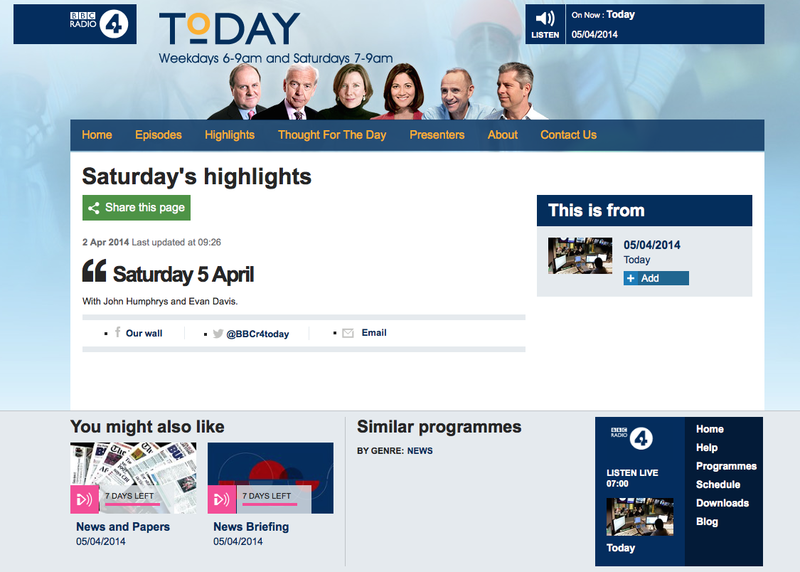 If you'd like a listen, click on the Today programme website. It'll be available for the next seven days... after which it will self-destruct. 'the chatterati'. Love that. Sometimes they are just lazy.